All of the staff was always friendly and helpful. The property and cabin are a lot nicer than they appear on the website. I could have just stayed at the cabin and enjoyed it the four days that we were there instead of going anywhere. We actually decided to have all of our dinners there instead of going out because of the nice kitchen and grill. Thank you for leaving your cozy and clean cabin to us for 5 days. There is so much I still want to do but sadly we leave today. Loved the cabin, view, and fire pit. Only complaint is the bedroom painting (a little creepy), but all and all a much needed vacation for my boyfriend and I. We will definitely be back. P.S. Look in the guest manual upon arrival so you don't miss any awesome places to explore like we did! Thanks again! Our Honeymoon! Wow, what a drive up. Glad we drove the truck, but worth it! Great cabin for 2. Love the seclusion. We rode the Great Smoky Mountains Railroad and loved it! Went horse back riding. Rode the Road to Nowhere + walked through the tunnel. Loved grilling, fire pit, and hot tub! Also the rockers on the deck with an awesome view! 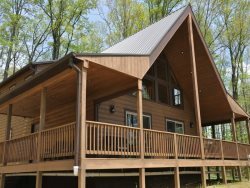 This cabin was perfect for our honeymoon in Bryson City. It's secluded enough to give a sense of privacy, but isn't too far from local attractions. Everything was neat, clean, and comfortable. Stayed for a weekend to celebrate our Anniversary without our kids for the first time since they came along. Loved the cabin, the Porch, Fire Pit, hot tub, and especially the view! Getting up the mountain was an adventure. Hiked Deep Creek and loved the waterfalls was very relaxing and enjoyed it! Our cabin was great. Clean contained everything we needed. The view was amazing and the service from rental company was excellent. Manager Response - Jul 31, 2013: Thank you, R Rivera, for taking the time to review Bear Hug Cabin. We appreciate the feedback. Please keep us in mind for your future vacations. As a repeat guest you will receive a 10% Discount when you call to book. Stayed here for the second half of our honeymoon. Loved the scenic views!! The ride up here was a little intense, but we loved the location. The hot tub was fantastic and great after long hikes. Hiked at Deep Creek, Smokemont and Cades Cove. Gorgeous! This was a wonderful trip! Thank you so much! Come for a 4 day vacation! Best vacation, we went to the casino while we were here and won 1,597.00 on a slot machine! Most I have ever won. Relaxed in this nice little cabin and we loved it. We will be back!